In October 2018, I visited the SAVA region of northeast Madagascar for two weeks. 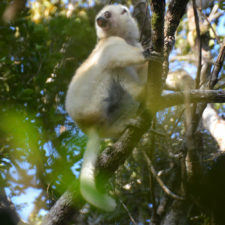 My goals: 1) hike in Marojejy, 2) see the rare silky sifakas, 3) learn about local reserves in the area, and 4) learn about the Lemur Conservation Foundation (LCF)’s work in this region. 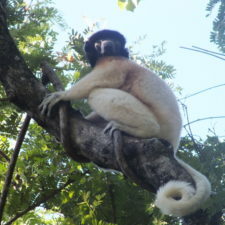 Read my blog post about visiting Marojejy National Park to see silky sifakas. This fish farm, supported by the Lemur Conservation Foundation, provides sustainable protein for the villagers near Marojejy National Park. On the way to and from Marojejy National Park, hikers walk along a rolling dirt road through two villages. You pass a library, two fish ponds, and a bridge which joins the villages — all supported by the Lemur Conservation Foundation. 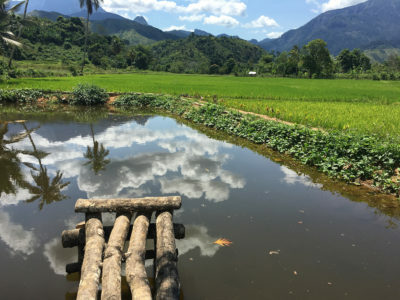 The bridge allows children to get to school without crossing the river on foot, and the fish ponds provide a renewable source of protein and nourishment for the villagers. Mr. Jacques Harison Tonkasina, known as Jackson, is an expert guide for Marojejy National Park and the SAVA region. 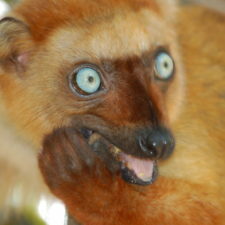 I hear about Lemur Conservation Foundation’s work in the area from my guide, Jackson — Mr. Jacques Harison Tonkasina. Jackson regularly works with Dr. Erik Patel of LCF and is not only a very accomplished guide, but also an outstanding carpenter who led the construction team that completed repairs to the kitchen and dining area at Marojejy Camp 1. Jackson has a big smile and a friendly, approachable personality. He lives in this village of Manantenina with his wife and kids. His work as a guide means he has one of the nicest houses in the village! As we walk through town, Jackson is greeted with smiles and waves and handshakes from passersby of all ages. One man is learning english, and greets me with a smile, “Hello! How are you? You are American!”. 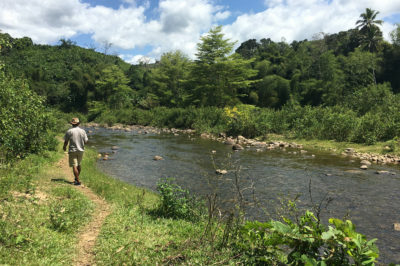 Jackson is the proud owner of Anolakely Reserve, a 3.78 hectare area of forested land in Manantenina that he has purchased with money he earned as a guide for the SAVA region. With LCF’s support, the Anolakely Reserve is thriving. Jackson grows seedlings in the nursery and plants native trees including rosewood. 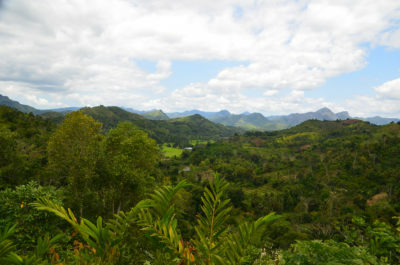 Tourists have started to visit; here they can see northern bamboo lemurs, chameleons, frogs, and other animals, along with beautiful vistas of the green, hilly countryside surrounding Marojejy. Jackson walks along the river to his reserve. 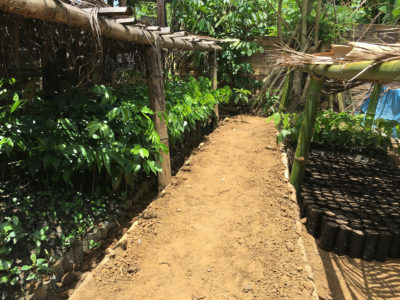 This nursery grows seedlings which Jackson then plants to reforest the land in his reserve. Walking through the village, we arrive at the bridge when Jackson and I veer right towards the river. We take off our boots and cross the river on foot; it’s only a few inches deep and about 100 feet wide at this spot. After crossing the river, we meander along the edge and up through short plants until we reach Anolakely’s nursery. We continue walking to a patch of bamboo, hoping to spot bamboo lemurs, but they must be napping deep in the bamboo this warm afternoon. 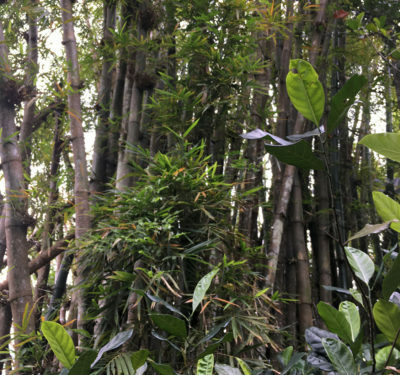 Jackson shows me some newly planted rosewood trees and bamboo, as well as some vanilla growing in this low forest. 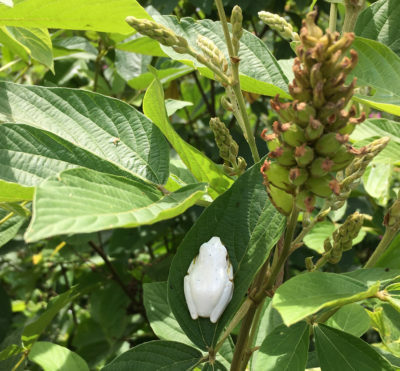 He explains that he has an arrangement with a local woman who owns the vanilla plants; she will continue to harvest the vanilla for the next couple of seasons. And then, the land will be Jackson’s to reforest. This land has been slashed and burned and now grows nothing, but Jackson knows he can turn it around so it thrives once again. I have no doubt he can. There is so much hope in hearing Jackson’s passion for his land and for the plants and animals that also call it home. Jackson shows me the land he hopes to purchase and reforest. How much will it cost for this land? 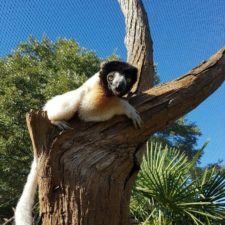 Upon returning from my trip, I spoke with Dr. Erik Patel and the Lemur Conservation Foundation to see what it would cost to increase Anolakely and purchase this neighboring area. The size of Jackson’s reserve is now 3.78 hectares, and the new land would add .28 hectares to the reserve. There are other nearby plots of land that could also be purchased to increase Anolakely even further. A budget of $1,000 USD would purchase the new land and provide money to increase production in the nursery to support it. Together, we can raise enough funds to increase the size of Anolakely and help Jackson bring this land back from the destruction of slash and burn. 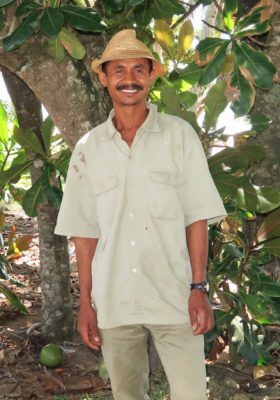 We aim to raise $1,000, which will purchase land from a neighbor to increase the size of Jackson’s reserve and help to grow his plantations for reforestation. Our World Lemur Day t-shirt campaign last October raised the first $300 of this campaign — let’s work together to fund this important local reserve! Can you help us make Jackson’s dream a reality? Stay tuned to Facebook where we launch our Earth Day campaign on April 22! If you donate through LCF’s website, please note that your donation is for Jackson’s Reserve.